As a long time Doritos fan, I’m always going down the chip aisle at the grocery store. 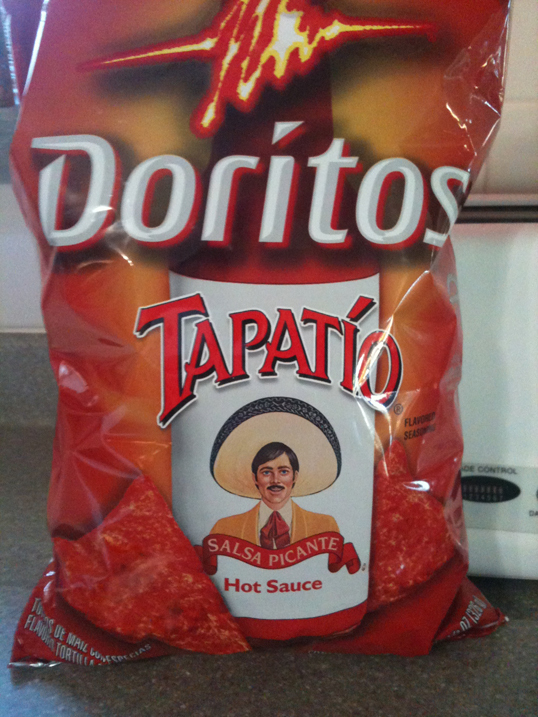 Not that long ago, I found the original Taco Flavor had returned, which I loved and still do. This last store visit, I found a new flavor – Doritos Tapatío – yes, that Tapatío the hot sauce you put on eggs and just about everything else. The chips are the same size as all the other Doritos flavors, but heavily coated with a red flavoring that is obviously laced with much Tapatío [assuming it’s not just something that’s imitating that Tapatío taste]. I hadn’t seen this much seasoning heaped onto a chip since Doritos made the Four Cheese flavor. The taste is good, but the hot kick is what happens a good 30 seconds after eating your first chip. The hot burn keeps going if you stop after one chip. And everyone knows you can’t eat just one. So you keep eating…. and the burn gets stronger with each additional chip consumed. That’s just from one chip. Then I look at my fingers and they are red in color. The above photo is my fingers after just one chip. 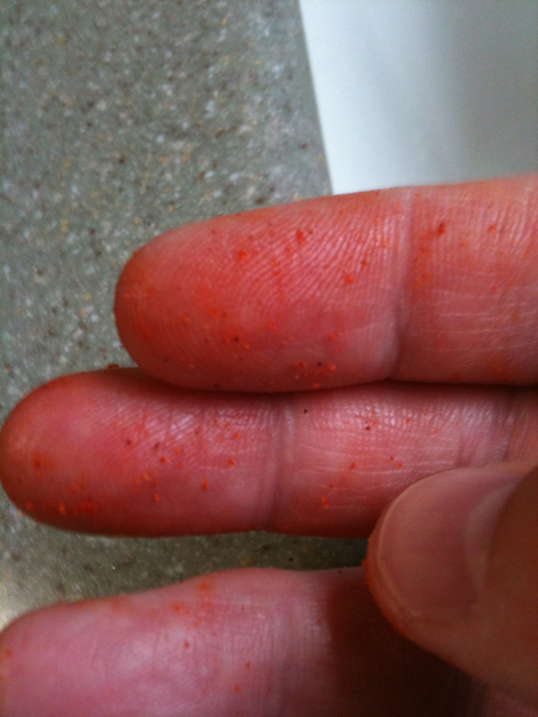 After a good 20 or 30 chips, I could turn anything I touch into a red hue. And while I prefer Tabasco green over Tapatío when spicing up my eggs, on a chip, this was actually pretty flavorful. Did I like them? I did, but the burn was a bit much after a while, but yet I couldn’t stop eating them. Not a problem… I endured the continued burn. But I admit that I probably won’t be buying them again as I prefer the other flavors and want to enjoy a nice taste without feeling like my mouth is burnt to a crisp. 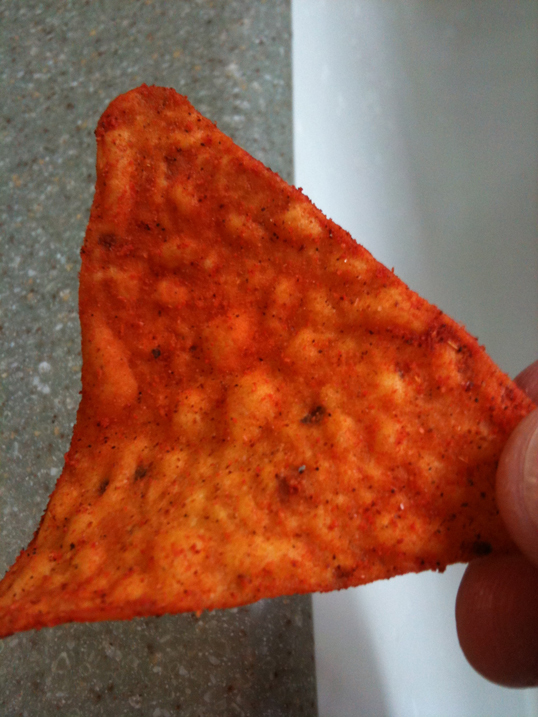 As a fellow Dorito lover, I would be curious to hear your thoughts and tastes if you find these and try them. oh hell no. i don’t do burn. Burn is hard to get used to. Yuck. I eat Doritos maybe once or twice a year, so these will NOT be making a list of mine anytime soon. Doritos are an acquired taste. I finally saw a retro bag of the taco flavor and immediately thought of you. I will, however, be skipping these. I don’t get the burn thing. I prefer something like wasabi that has kick, but doesn’t linger. Ahh.. the Taco Flavored retro bag. Love those. And cool I’m now associated with them. Wasabi is a nice kick on sushi. Yeah, Doritos seem to be finding how to introduce many flavors. I’m curious to hear how you like them. I saw a bag of the Taco Flavor just last night. I opted to by Cool Ranch as it’s my belief it isn’t as likely to result in finger-print stains on shirts and furniture. You make a good point about the stains on shirts and furniture. I like the Cool Ranch flavor, too. Ohhh, I love me some Doritos but I must admit that I haven’t seen this flavor here yet. Good lord I’m hungry now. Seems talk of Doritos makes everyone hungry. I’ve been through 3 bags of these already. They’re great! I hope they stick around at least for the summer. 3 bags? Your mouth must be burning (not to mention the red fingers). I still see them in the stores here in Salt Lake City.